A SpaceX Falcon 9 rocket payload fairing glides to Earth under its own parafoil in this photo unveiled by CEO Elon Musk on Instagram May 2, 2018. The fairing was used during the April 18 launch of NASA's TESS exoplanet-hunting satellite. It's a picture of serenity that caps a fiery trip to space. A new photo unveiled by SpaceX CEO Elon Musk shows half of a Falcon 9 rocket fairing, the protective nose cone that surrounds a payload, as it glides back to Earth under a parafoil. The image, taken after SpaceX's successful launch of NASA's Transiting Exoplanet Survey Satellite (TESS) on April 18, was captured during a test of technology intended to recover (and eventually reuse) payload fairings in the future. "Falcon 9 fairing opens parafoil after reentering the atmosphere," Musk wrote on Instagram May 2 in a post accompanying the photo. A SpaceX recovery team retrieved the payload fairing from the Atlantic Ocean but did not attempt to catch it as it fell to Earth with "Mr. Steven," a customized ship equipped with giant metal arms and a net to snag Falcon 9 fairings before they hit the sea. That's because TESS launched from a SpaceX pad at Florida's Cape Canaveral Air Force Station, and SpaceX's Mr. Steven is based on the West Coast, where it has been used to attempt fairing recoveries during launches from Vandenberg Air Force Base in California. Still, the sight of a SpaceX fairing floating down to Earth under a parafoil is something new. SpaceX has been pursuing fairing recovery as a part of the company's push for a fully reusable rocket. In the past, Musk has said each SpaceX payload fairing costs $6 million, so reusing those components could help lower the cost of a spaceflight. SpaceX has reused the first stage of its Falcon 9 rockets, as well as its uncrewed Dragon cargo spacecraft that ferry supplies to the International Space Station for NASA. 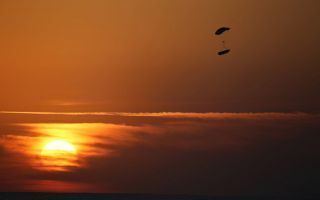 One of those reused Dragon capsules just returned to Earth for the second time Saturday (May 5). Last month, Musk said SpaceX is eyeing plans to use a "giant party balloon" to recover the second stage of its Falcon 9 rocket and then catch it on a "bouncy house." Details on that particular project, however, are slim.